Photograph from SAAVY collection, featuring members of the Asian Americans and Pacific Islanders for Kerry/Edwards during the 2004 election. Photograph of Tanzila Ahmed of SAAVY. Photograph of South Asian American Voting Youth (SAAVY) founder Tanzila Ahmed at the University of Michigan. Photograph of South Asian American Voting Youth (SAAVY) volunteer Shiny Mathew (right) registering voters at the University of Michigan. Photograph of SAAVY founder Tanzila Ahmed at the University of Michigan. 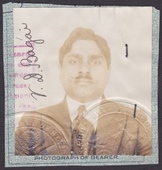 Passport photo of Vaishno Das Bagai. It is stamped by the Dept. State and signed "V.D. Bagai." It is understood that Bagai applied for a US passport in 1928 but was denied, due to nullification of his naturalization after the United States v. Bhagat Singh Thind Supreme Court decision. This photo may have been part of that passport application.